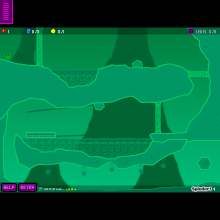 Jauntless is a game created by Gooey Games. Please do not copy this game, as it was a completely original idea by me. Now please enjoy the story : You play as a mysterious creature that is exploring the galaxy. Your starship crash-landed on a strange planet that is completely encrusted with gemstones of all types. After being ejected from the starship, you landed on the other side of the planet, miles from your ship. Now you must journey through these strange, crystalline lands, collecting powerful gemstones to convert into energy for your starship. Good luck.